Home / Dash of Insight / Stock Exchange: Is The Market’s Momentum Back? Review: Who Moved My Cheese? Our previous Stock Exchange asked the question: Who Moved My Cheese? It was a reference to a popular business fable from 1998, and we discussed the importance of understanding that the market is dynamic and trading strategies should be too. Building on last week’s topic, we get a little more specific this week in discussing the dynamics of momentum trading. This Week: Is The Market’s Momentum Back? If you don’t know, momentum trading is a strategy whereby traders buy or sell according to recent price trends. For example, if a particular stock (or the overall market) has been rising, a momentum trader might buy that stock (or the overall market) in anticipation of continuing near-term price increases. There’s more to it than that (for example, is the direction supported by high trading volume, or how long should a trader ride the momentum), but in a nutshell–that’s the strategy. 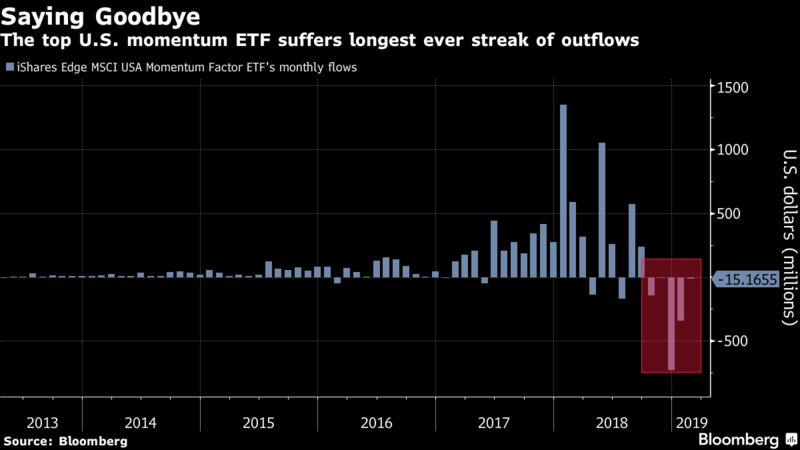 Not surprisingly, the top US momentum ETF recently suffered huge outflows as our raging bull market turned bearish in the fourth quarter, as shown in the following chart. We generally agree with that notion, and we took it to heart as our momentum trading models exited their positions, and only recently (within the last few weeks) started reallocating significant capital to momentum trades. As we’ll see later in this report, our momentum trading models ride their momentum trades for varying time periods. We are sharing the performance of our proprietary trading models, as our readers have requested. We find that blending a trend-following / momentum model (Athena) with a mean reversion / dip-buying model (Holmes) provides two strategies, effective in their own right, that are not correlated with each other or with the overall market. By combining the two, we can get more diversity, lower risk, and a smoother string of returns. Since many clients combine the trading models with our long-term fundamental methods, they have additional diversity of methods without the need for short-term timing. For more information about our trading models (and their specific trading processes), click through at the bottom of this post for more information. Also, readers are invited to write to main at newarc dot com for our free, brief description of how we created the Stock Exchange models. Note: This week’s Stock Exchange report is being moderated by Blue Harbinger, a source for independent investment ideas. Road Runner: I bought shares of Shopify (SHOP) on March 8th. I am basically a momentum trader. I like to buy stocks in the lower end of a rising channel, as you can see for Shopify in the following chart. Blue Harbinger: Not going to lie, Road Runner–if you can handle a healthy dose of high volatility, Shopify is a fantastic long-term growth stock. I cannot believe you and I actually agree on something. RR: Not so fast, BH. I didn’t buy Shopify because it’s a great long-term growth stock. I am a trader, and my typical holding period is only around 4-weeks, on average. 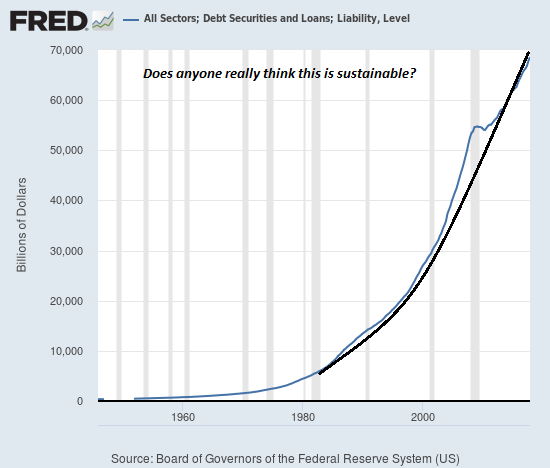 BH: But this long-term growth story is fantastic. Shopify is basically an operational platform for small and mid-sized business, and it is growing like wildfire. They do everything from creating an online storefront for your product, they handle marketing, advertising, shipping, inventory, you name it. This company has an enormous total addressable market (basically anyone with a website who wants to make more money than they pay for it), and Shopify has essentially zero competition. You’d have to go to China to find another company that does anything similar with the same scale (I am talking about Baozun (BZUN) here), but for now they’re both playing in their own ginormous sandboxes (i.e. they don’t compete with each other). Here is a look at the Fast Graph. RR: Take it easy, BH–you’re getting a little emotional about this one. Emotion is one of your behavioral disadvantages as a human. I, however, am a computer-based trading model. I haven no emotions, I am completely objective–that’s one of my advantages. BH: Well at least we both agree this is a good momentum opportunity–we just have different time horizons. Athena: While you two argue over time frame (and over who is more or less emotional), I have a trade to share. I bought shares of Coupa Software (COUP) on March 7th. BH: What’s up with you trading models this week?… you keep buying companies I know. Coupa Software provides a cloud-based spend management (“BSM”) platform solution that connects organizations with suppliers globally. They’re not really profitable right now, but that’s okay because they are a growth company, and revenue has been growing at a very healthy clip. I think this one has momentum on its side, and a great runway for long-term growth. Athena: Take it easy on all this long-term growth talk, BH. I am also a technical trading model, and I too am into momentum, but I typically only hold for around 17-weeks. And as a reminder, I am a best ideas “queen of the mountain” trading strategy. I hold the best ideas from several of our trading models, until something better comes along and replaces an existing holding. Felix: I don’t have any specific trades to share this week, but I do have a ranking to share. I am a momentum-based technical trading model, and this week I ran the stocks of the Nasdaq 100 through my model, and I’ve ranked the top 20 below. BH: Thanks for sharing those rankings. I know your holding period is a lot longer than the other traders–typically around a 66 weeks. It’s always fun to see the stocks you like. Oscar: I have some ETF rankings to share. As our resident sector/ETF rotation model, this week I ran our “Comprehensive and Diverse ETF Universe” through my model, and the top 20 are ranked in the following list. BH: It seems like (TAN) the Invesco Solar Power ETF has been ranked at the top of your list more than once. Thanks for sharing these ideas, Felix. 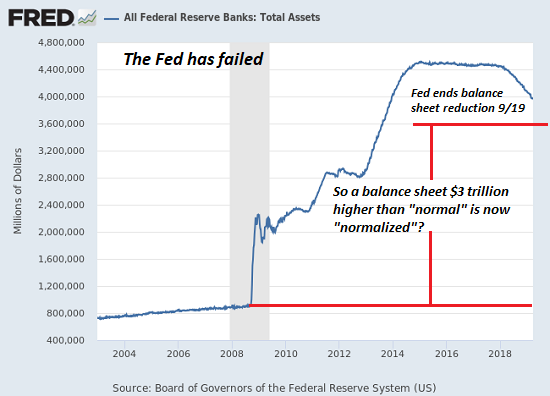 With the market rebounding this year, and the Fed seemingly much more accommodative now, it appears the market has momentum to the upside now. Momentum can be a powerful strategy, but if you miss the inflection points that can create challenges. Our own momentum-based trading models have been re-entering trading positions in recent weeks as the market has increasingly found direction; however the models enter their momentum trades with varying time frames in mind. Do you trade momentum, and if so how long do you let your winners run? Readers are welcome to suggest individual stocks and/or ETFs to be added to our model lists. We keep a running list of all securities our readers recommend, and we share the results within this weekly “Stock Exchange” series when feasible. Send your ideas to “etf at newarc dot com.” Also, we will share additional information about the models, including test data, with those interested in investing. Suggestions and comments about this weekly “Stock Exchange” report are welcome. Your can also access background information on the “Stock Exchange” here. Trade alongside Jeff Miller: Learn more. 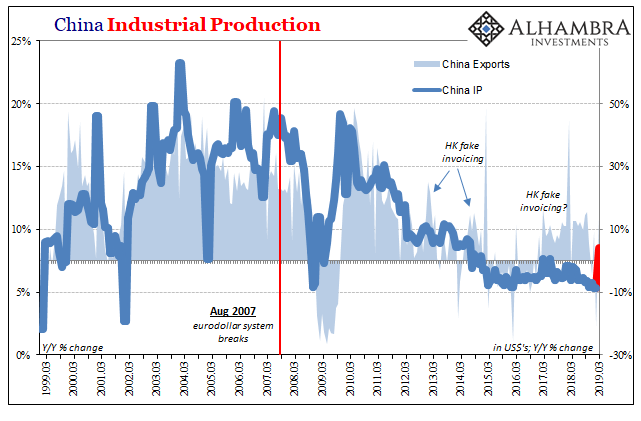 Previous Weighing the Week Ahead: Will Slowing Chinese Growth Spark a Global Recession? Next Weighing the Week Ahead: Will the Fed Hint at a New Course?